“Chinese tablewares: The archaeology of illustration, and scratch analysis, at the Harrietville Chinese Mining Village, northeastern Victoria”, by Paul Macgregor, publishedin Caroline Spry et al (eds), Excavations, Surveys and Heritage Management in Victoria, Vol. 7, 2018, p. 85-92. This article is based on a paper presented by Paul Macgregor at the Victorian Archaeology Colloquium 2018, held at La Trobe University on 2 February 2018. During archaeological investigations conducted at the Harrietville Chinese Mining Village in October 2017, an assemblage of Chinese and European ceramics—including tablewares—was identified. Previous analyses of tablewares from archaeological contexts associated with the Chinese diaspora have largely focused on the types of wares present and their decorative features, and how these can be used to determine ethnicity and acculturation. 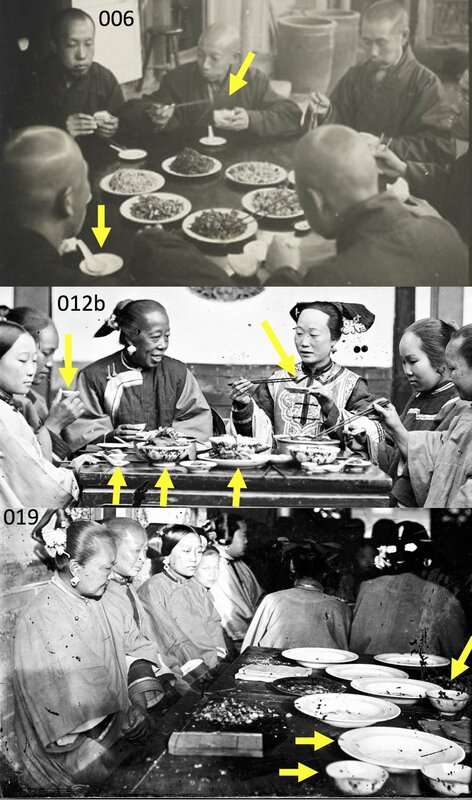 This article uses information derived from historical images of Chinese food practices and the results of scratch analysis on ceramics to provide a preliminary overview of how Chinese people used tablewares at the Harrietville Chinese Mining Village. Examples of Chinese-made Winter Green tablewares found during excavation at Harrietville: eating bowl (00182), spoon (00584/00811), teacup (00635), wine/liquor cup (00388); along with part of a European-made Asiatic Pheasant plate (00786) which may have been used as a serving plate in a Chinese eating context.